So what is Pedal Boarding Exactly? 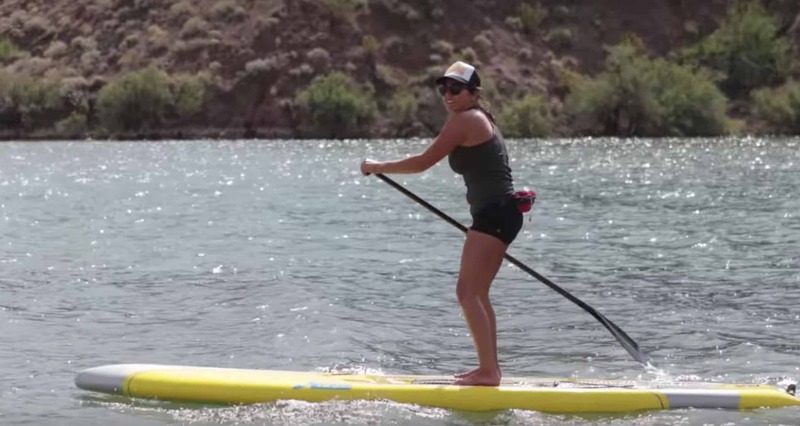 Most individuals are familiar with paddle boarding, but what is pedal boarding? If you are open-minded about trying new outdoor products, then the pedal board might be for you. 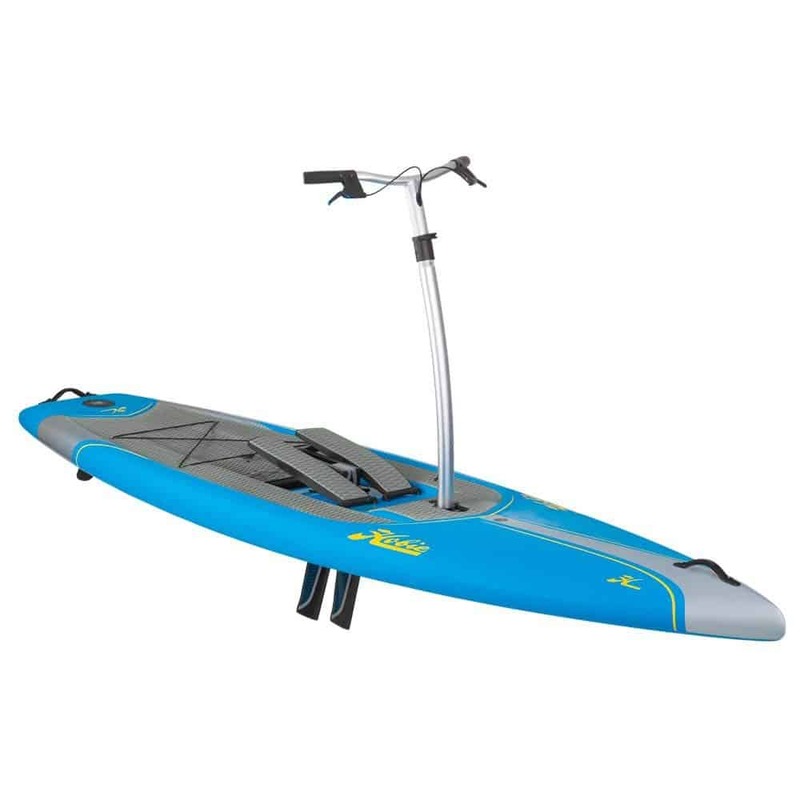 It allows you to stand up on a traditional looking paddle board that has a pedal drive system in the middle of the board that propels you through the water by the rotating rudder that is beneath the board. A pedal board is basically a paddle board only with handlebars, pedals, and a rudder. There are pedals on the top-side that allow the rider to move in a stair-step type motion. This motion from the rider promotes movement from the rudder because as the rider steps on the pedals and the pedals allow the rudder beneath the pedal board to rotate. And as the rudder rotates, the board is propelled forward in the water. Pedal boards require a very minimal set up, as it just comes with a removable rudder and remove-able handlebars. Because these features are removable, this optimizes the owner’s ability to transport the pedal board anywhere they want. Also aiding in the transportation is being able to reduce its weight easily. Typically, it weighs anywhere from 40-60 pounds and is extremely durable. The features that are usually included are gear tie-downs, a bow handle, and a kick-up or removable rudder. Because there is a pedaling motion being performed by the rider’s lower body, there was a need to have handlebars that are extended vertically from the board to ensure that the rider has the proper stability needed to maintain motion forward without losing balance. On these handlebars, there are fingertip controls that allow the individual riding the pedal board to change the direction of their movement. These handlebars are removable in order to allow the owner to transport the board quickly and easily. It also allows for easy storage. One of the few companies on the market that produces and sells pedal boards is the world famous company Hobie. 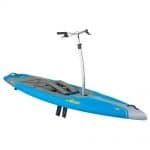 They have created the Mirage Eclipse Stand Up pedal board with the intent on making paddle boarding more stable and fun. Width: 33.5 inches (0.85 meters) wide. The pedal board itself is made out of advanced composite epoxy. 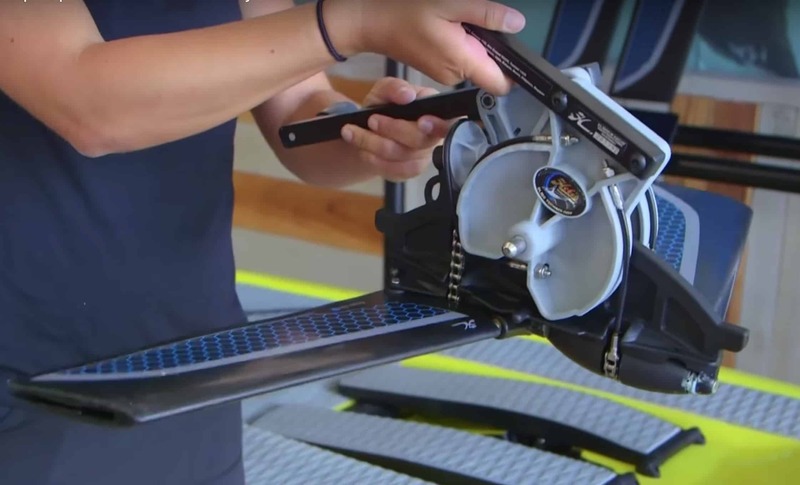 The board is also wider than a paddle board, allowing for optimized stability as well as easy control through wind, waves, and the wake of the ocean. 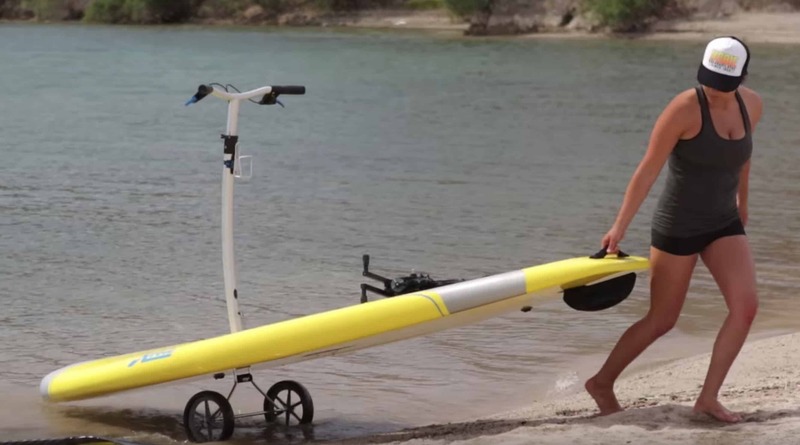 The Hobie also has a removable rudder, removable handlebars, and comes with a paddle so you can use it as both a paddle board and a pedal board if you so choose. The Mirage Eclipse is very stable and easy to maneuver for both beginners and advanced riders. The drive system is quite impressive as you can see above and below. As you pedal, the drive moves two fins below the board back and forth like flippers that propel you forward. It is quite impress to watch in action as you can see in the video near the top of this page. 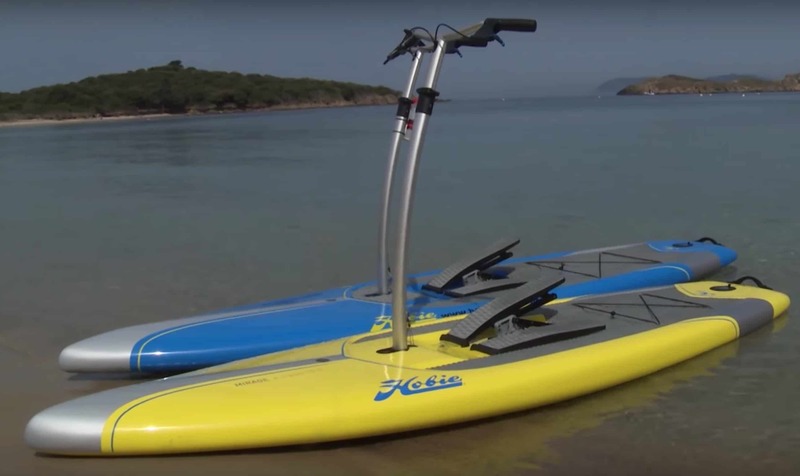 Hobie patented this drive system and started using it in their hands free pedal kayaks. After perfecting it there, they decided to impliment it into their design. Brilliant really. What is the ride difference of a Stand UP Pedal Board vs. a Stand up Paddle Board? The energy exerted on a pedal board is much less than that on a pedal board as you have handle bars to help give you stability and then all that is left is to pedal vs on a paddle board, there is a lot of body movement and shift of balance and weight as you paddle side to side. It is actually easier for first timers to maneuver especially with handle bars to grip vs with a paddle board you will need to have a better sense of balance depending on what kind of board you are riding. As far as comfort goes, It is fairly nice to be standing on movable foot pads, vs sometimes a hard paddle board deck. This is not to say this is the case for all SUP’s as an inflatable SUP is fairly comfortable all around. You are still missing the relaxing presence that the handle bars offer you though. When it comes to a smooth, relaxing ride, the stand up pedal board wins flat out. It is just really hard to beat the comfort and fun that you can have on one of these. 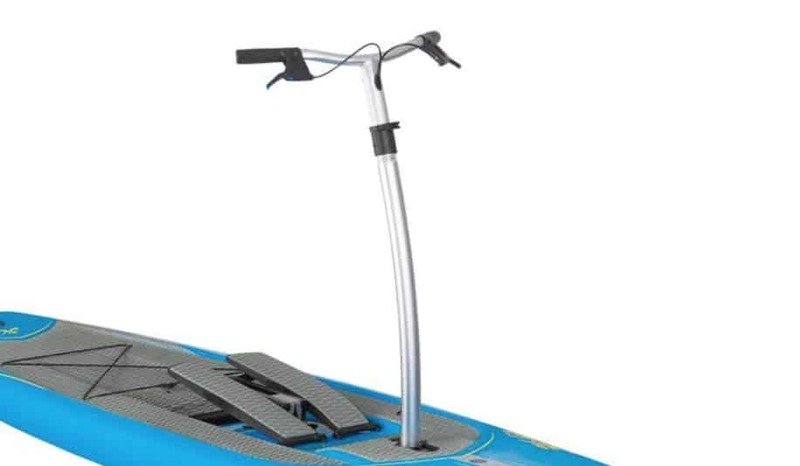 Not to mention, you can just pull the handle bars off and the drive system out and just use it as a paddle board. With all of these new things to consider, it still comes down to what makes more sense for you and what you are after. If you want a better leg workout and cost is not an issue, the pedal board is a great way to go. If cost is an issue and you would like a more “full” body workout, than a SUP is more up your alley. Especially if you need to fit it in a small car to transport around, than an inflatable SUP is what you are going to want to look at. If you do end up choosing a pedal board, rest assured that Hobie is known for their quality and top rated products for many many years now. The Eclipse comes with a nice little set of wheels as you can see that mount under the board to take a lot of weight off and make it easier to transport back and forth to your car. This is not to say that you can’t carry it, but fully loaded down, this board weighs around 59 lbs (if you bought the 12′ model) so if you have a long walk of hike that might wear you down a bit. It is a good idea to note and consider that you can still use the Hobie pedalboard as a regular paddleboard. All you have to do is remove the handle bars, take out the drive system, and lock the rudder in place. You may also have to go out and buy a paddle of your choice as the mirage eclipse doesn’t come with one, but you are then ready to use it as a normal SUP. It would be super stable and still fun, but maybe not suitable for yoga or fishing as there isn’t a full deck pad and not a lot of hold down for fishing gear. It is just another thought to consider as you can see in the picture above it does work. These are an amazing invention and if you ever get a chance to go out and try one, I would highly recommend it. It is a lot more than most paddle boards ($1,899.00 + $175 Shipping) but you get a lot more as well. To each their own, but we are excited to share them with you. Please be sure to comment below and let us know your thoughts or your experiences if you have tried or purchased one yourself. . Stand UP Pedal Paddle Board? What Is It? Overall rating:	5	out of 5 based on 5	reviews.